Orange River Rafting adventures for the whole family! Click here to view our New Year trip options! Orange River Canoeing at it’s best! Amanzi Trails offers canoeing and rafting trips on the Orange River that you will talk about for years to come! Join us for 2 to 5 sun-soaked and fun-filled days on the Orange River as it meanders through the rugged landscape of the Richtersveld. Camping on the Orange River. 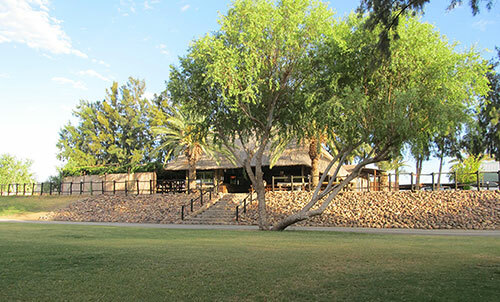 Amanzi River Camp, Noordoewer, Namibia, is your ideal stop-over on your Namibian adventure or a perfect getaway for a relaxing & tranquil break from city stress. Green lawns, ample shade, a spectacular view across the river onto the Geelkrans cliffs and clean ablutions with good water pressure and hot showers will make this a visit not to be missed. 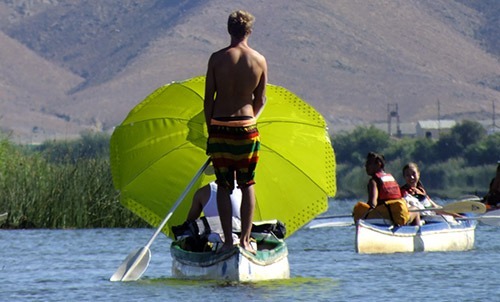 Is an Orange River canoeing trip on your bucket list? Have you been postponing it year after year? Visit our press page to see what trip options are available in 2018 & 2019. You won’t regret it! Welcome to the online home of Amanzi Trails River Adventures. We specialize in Orange River rafting adventures. The Amanzi Trails River Camp is approximately 700 kilometres from Cape Town, halfway between Cape Town and Windhoek, Namibia’s capital city. It is situated on the northern banks of the Orange River, close to the town and border post of Noordoewer in the ǁKaras region of Namibia. This region boasts many attractions, such as the rugged Richtersveld landscape, the Fish River Canyon and Ai-Ais hot water springs, the picturesque town of Luderitz with its nearby ghost town of Kolmanskoppe and the Quiver Tree Forest and Giant’s Playground near Keetmanshoop. Activities in the area include canoeing and river rafting on the Orange River, walking the 5-day Fish River canyon hike and dune driving at Luderitz. Canoeing / river rafting with us is for many a life-changing experience. This wilderness experience is a complete breakaway from frenetic urban lifestyles. Paddling between the beautiful rock formations of the Richtersveld where quiet stretches of the Orange River contrast exhilarating rapids, is food for the soul. These fun-filled trips are family-friendly and suitable for people of all ages! The team at Amanzi have been guiding for many years and will guide you safely down the river while you take in the fun and experience of your Orange River Rafting adventure. They will also cook delicious and wholesome meals for you while you relax and soak up the tranquillity. For those who want to experience the Namibian beauty from the land, Amanzi River Camp is a good place to begin your holiday or is a destination in itself. We offer spacious, grassy and shaded camp sites, along with clean ablution blocks and hot showers with good pressure. A small shop sells meat, drinks, wood and ice or you can join us for a sundowner at the well-stocked bar in the main lapa. The camp sites overlook the river and the majestic Geelkrans cliffs – the peacefulness will always make you want to stay longer than initially planned. Come and experience one of our Orange River Rafting trips or relax at our camp site. Your stresses will be guaranteed to fade into the background and you will develop a new perspective on what is important in your life.